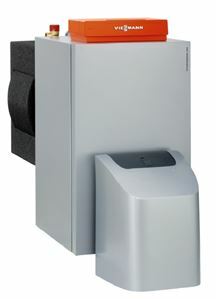 The Vitorondens 200-T is a floorstanding cast iron oil condensing boiler with an attractive price/performance ratio. Their dimensions are impressively compact and they are particularly suitable for modernisation projects. Combining the durable Eutectoplex heating surface with the downstream Inox-Radial heat exchanger made from stainless steel separates combustion and condensation effectively. The benefit lies in the fact that the combustion residues remain in the combustion chamber, whilst the combustion gases can condense in the heat exchanger without leaving any residues behind. The Vitoflame 300 blue flame oil burner is designed for all commercially available EL-type fuel oils, and ensures particularly clean, environmentally responsible and efficient combustion. As an option, up to ten percent bio-oil can be added to the fuel oil. Kerosene conversion kits are available for the 35.4kW, 42.8kW and 53.7kW boilers (see accessories). NOx emissions for the Vitorondens 200-T using kerosene are less than <120 mg/kWh. The Vitotronic 200 control unit with plain text display and graphic support enables easy, self-explanatory operation with user prompts. The Vitotronic enables the convenient control of heating systems with one heating circuit without mixer and up to two heating circuits with mixer. 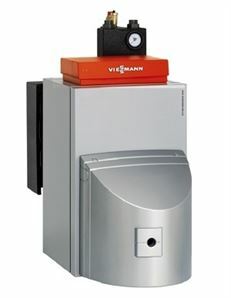 Vitocell DHW cylinders from the Viessmann range of accessories are available to complement this boiler.